It is widely understood that as in all science and engineering fields, minorities are acutely underrepresented in Biochemistry and the biomedical workforce. The newly established Bachelor of Science degree program in Biochemistry will provide chemistry and other science students an expanded field of career options. This will be a welcomed development for many of the students in the School of Science who have shown an interest and are keen in pursuing an undergraduate degree in Biochemistry. With the implementation of this program, the Department of Chemistry will offer two baccalaureate degrees: a B.S. degree in Chemistry and a B.S. 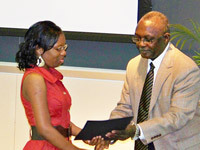 degree in Biochemistry. Both degrees will be certified by the American Chemical Society. The Forensic chemistry program that was established five years ago will continue to be offered as an option within the Chemistry curriculum. Biochemistry is the study of the chemical processes in living organisms. It deals with the structure and functions of cellular components, such as proteins, carbohydrates, lipids, nucleic acids, and other biomolecules. Biochemistry combines biology with organic chemistry, inorganic chemistry, and physical chemistry to elucidate the mechanisms by which living things obtain energy from food; the chemical basis of heredity; and biological changes related to disease. Our program represents a carefully designed curriculum that combines key topics in biological, chemical, mathematical and other sciences to provide the student an educational experience leading to an undergraduate degree in Biochemistry. 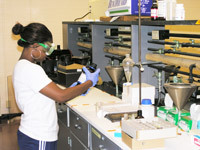 The program will place Hampton University in a rather unique position in three respects: (1) we will be one of very few institutions that offer an undergraduate degree in Biochemistry; only three other HBCUs offer this degree; (2) it will promote our visibility for student recruitment and also enhance our competitiveness for research and other programmatic grants; and (3) the program will provide a suitable medical/biomedical career path alternative for the large number of students who matriculate at HU with medical careers in mind. Electives for biochemistry majors can be selected from: CHE 415, CHE 419, CHE 508, CHE 512, BIO 424, and BIO 512.